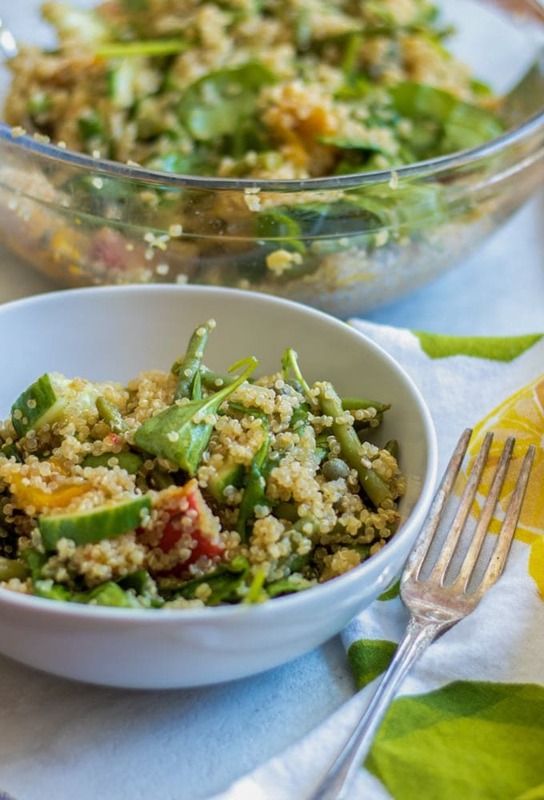 Quinoa Spinach Salad: A refreshing and light easy quinoa salad served over spinach with a fresh lemon dressing. This simple vegan quinoa salad is the perfect lunch, meatless entree, or compliment to grilled meat. Hello Spring! My fingers are crossed that warmer weather is here to stay! 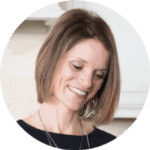 And when welcoming in the warmth and sunshine into my life, my cravings changes from warming soups and comforting casseroles to light and fresh salads and pastas, like Tortellini and Spinach Bowl and Southwestern Chicken Cobb Salad. And that is why prepping protein rich salads in advance, makes eating healthy EASY despite a busy schedule. This summer quinoa salad comes together in less about 30 minutes, is versatile enough to use whatever produce I have on hand, and is packed full of the nutrients and protein my body needs, making this a meatless, yet high-protein option perfect for a quick lunch or a light dinner. In fact, Spinach Quinoa is one of my 30 minute gluten-free meal go-tos. Or boil quinoa on the stove. Once the quinoa is cooked, toss it with fresh spinach. Feel free to use any lettuce you have lying around. Personally, I like the way spinach wilts when tossed with a warm grain. Whisk together the lemon juice, lemon zest, capers and olive oil. Finally, drizzle the fresh lemon dressing. This quinoa salad is EASY and versatile–because that is how I like to roll. This quinoa salad is great as it sits. I will make it the day before a party or while I am prepping meals for the week to have on hand for quick lunches. As I mentioned, I love spinach in this fresh spring salad, but arugula or other green lettuces also work well. If you like really spicy foods, increase the red pepper flakes to 1/2 teaspoon. If the texture of capers is off-putting to you, throw them in the blender with the lemon juice, olive oil, salt and pepper and blend until smooth and then toss with the remaining ingredients in the salad. This will give you amazing flavor without biting into a whole caper. 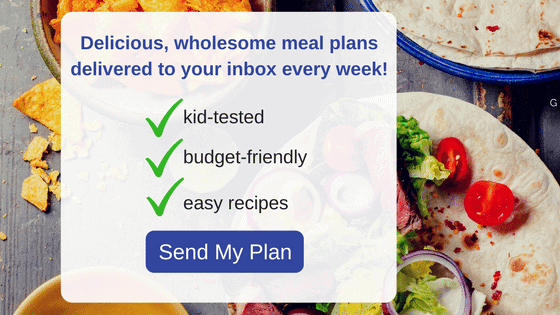 Be sure to check out all my Easy Healthy 30 Minute Family Meals Or if you are looking for Gluten free Recipes–check out my collection of Easy 30 Minute Gluten-Free Meals. 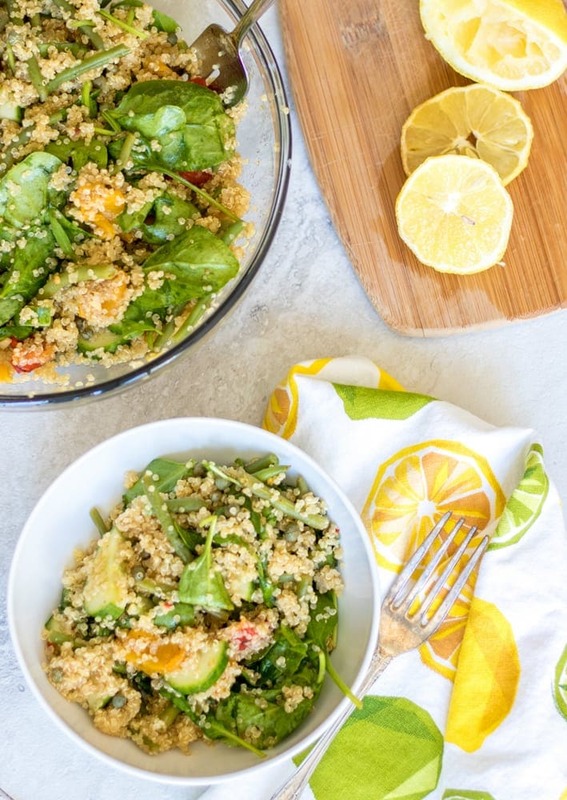 A refreshing and light vegan quinoa salad served over spinach with a fresh lemon dressing. Bring stock, quinoa, green beans, 1/2 teaspoon salt, oregano, garlic, and red pepper flakes to a boil. Reduce heat to a simmer and cover. Cook for 15 minutes, or until quinoa has absorbed liquid. Allow quinoa to cool slightly for about 5 minutes, if desired. Place spinach in large bowl and toss with cooked quinoa, mixing together allowing spinach to wilt slightly. Add in cucumbers and peppers and toss. In small bowl, combine the juice and zest of a lemon with 1 teaspoon salt, pepper, capers, and olive oil. Pour over quinoa and toss together. Eat immediately or chill for later consumption. I love all these fresh goodies here. Thumbs up! perfect spring food. Thanks so much! I love adding so much freshness to salads. I would love to have this fresh salad on hand for weekday lunches! That is the what I crave for lunches as well. so fresh and bright, I know this has great flavor! we have been enjoying big salads as dinner on some of our early warm spring days, and I love adding quinoa to the greens. pinned this one to try soon, thanks! I love having salads on warm days–and thank goodness warmer days are here!! Quinoa is among my favorite food. 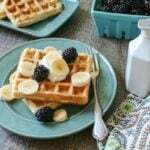 I love the soft texture and the delicious taste as well. Preparing it with spinach is just a perfect combination and the dish looks yummy…. I am SO making this recipe this weekend! I have been using quinoa in a lot of dishes lately, and I love using it in salads. We have a local provider of fresh spinach, too, that I love buying from. The texture of the spinach against the texture of the quinoa is a perfect marriage. Thanks DeeDee. You are very lucky to have a local provider of spinach! What a delicious and healthy spring dish! Oh I love me some fresh quinoa salads. I adore the ingredients you’ve used here – fresh, simple and totally delicious!! I always have a ‘stash’ of quinoa in the refrigerator, and love to throw it in salads like this. Your salad looks so fresh and healthy! Susan, that is so genius to have quinoa on hand in the fridge. This one is so simple but yet so flavorful!! Can’t have too much quinoa around here. Love it. This salad looks like a winner! Quinoa is such a super food–so great to have around! Love that you cooked the quinoa in broth. What a healthy way to add fabulous flavor. Always best to add flavors in every way you can! I’m all over filling salads and have, recently, started to really concentrate on increasing my protein intake so this would be perfect! Awesome Kelly–this salad will be perfect for your goals. right up my alley. I love quinoa! Thanks April. Quinoa is awesome! This sounds like a perfect dish for summer produce. Thanks for the idea! Oh Jessica, I hope you give Quinoa a try and let me know what you think. It is a really great grain–so good for you and so easy to prepare. My husband has declared it better than rice. Thanks Nancy! I hope that this dish is a huge success at your brunch–please let me know how everyone likes it. I am headed to your party now to check it out 🙂 Thanks for the invite! I just bought some quinoa last week. I think I will try your recipe. I can’t wait to hear how you like it. Keep me posted. I used French green beans and YJUM-OLA !!!!! Thx 4 the gr8t recipe! You are SO SO welcome!! French Gren Beans would be fab in this!! Gorgeous spring salad Kristen. Love the quinoa with the bright greens and lemon dressing. Delish!!!! I love all the flavors here–capers, roasted red peppers, lemon. Now that it’s FINALLY warm out, I can’t wait to try this! On my podcast this week our weekly challenge is to eat a salad every day! This salad is definitely going to have to make an appearance. Looks fantastic! !